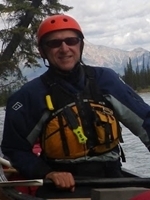 I thought perhaps I'd add a few comments about my recent visit to Prince Albert National Park. PANP is a little less than an hour's drive north of Prince Albert, and about 2.5 hours north of Saskatoon. I'll add some photos at a later date. Our family of four, including daughters aged 3 (nearly 4) and 7, was joined by my wife's cousin and husband. The latter is an experienced canoe-tripper and wanted to introduce his wife to canoe tripping. PANP happens to be a great place for that. After paying our fees at the gate and registering at the office for camping and paying more fees (whew, camping in a National Park is expensive! ), we drove to the put-in 30 km from Waskesiu at the Kingsmere River. The Kingsmere River is a lazy and beautiful creek that wanders between high banks and connects Kingsmere Lake with the north end of Waskesiu Lake. The current is moderate to slow, and one can paddle upstream without difficulty. Our fleet included my wife in her 17' cedar-strip kayak, my daughter in her 11' skin-on-frame kayak, Ashley & Ryan (cousin & cousin-in-law) in our 17' fibreglass Clipper Ranger, and me, Kaya the dog, and my younger daughter in our new 17.5' Royalex Swift Yukon with third seat. Although our daughters took turns in the kayak and sometimes paddled on their own, we typically towed them when we had anywhere to go. We decided to camp at the Southend campsite on Kingsmere, a short paddle and long portage away from the put-in. The portage appears as a roller ramp just 400 m upstream from the boat launch. From the roller ramp, canoes and kayaks were loaded onto the rail carts used to negotiate the 1km long rail portage. There are two types of carts here. There is a small two-wheeled cart that worked well for one person to move one loaded canoe down the portage. There is also a large and very heavy four-wheeled cart capable of carrying a fishing boat and motor across the portage. This larger cart worked reasonably well for me to carry the three remaining boats, stacked one on top of the other with their loads. This large cart, painted green with John Deere stickers, is difficult for one person to push, especially on the uphill sections, however it is easier than portaging all of the boats and gear separately (and with two young kids we had a lot of gear). With two and three people pushing the large load is far less brutal and on downhill sections the trick can be to maintain control (there is a brake but I was pulling instead of pushing the lever). With the portage out of the way, another 700m or so of river deposit you onto Kingsmere Lake very near the Southend campsite. When travelling through this reedy area, keep your eye open for Blue Herons where the lake meets the river. I have also seen moose along the river (south of the put-in). The southend campsite can handle maybe 7 groups (some large) at once, has a kitchen shelter with a wood stove (which would have been useful in miserable weather), two bear raised bear caches, and two outhouses. You need not paddle to reach Southend as there is a hiking trail that connects with the parking lot at the Kingsmere River put-in. The trail is an offshoot of the Grey Owl Trail and continues on to the nearby warden's cabin. This campsite was our home for 4 nights while we did day-trips in the area. There are also numerous other campsites in the region, along the east shore of the large lake, as well as in the connected smaller lakes of the nearby Bagwa Route. The south end of Kingsmere Lake near the campground is very shallow and sandy so was a good place for the kids to play in the water and to mess around in the boats. The beach itself is mostly rocky or weedy in this spot, so on one of our days we paddled over to a nearby sandy beach so the kids could play in the sand. Sand is one thing you will find a lot of on Kingsmere Lake, we found it in our tent, in my binoculars, in my coffee, in our sandwiches, in our beer, and more. Our first full day on Kingsmere was very calm, so we decided to take advantage of it and head out for a paddle on the large lake. We had the destination of Grey Owl's cabin in mind, but knew that everything would have to work out perfectly to achieve that goal and make it back safely. The lake is 11 km long and about 7km wide so it is large enough to get some good waves which tend to pile up on the shallow east side. We brought enough food and stuff with us in case we had to wait out any wind. Travelling with just the two canoes we headed out northward across the lake, more or less following the eastern shore. Our intention was to "play it by ear", only going as far as weather, kids, and our resolve allowed. Making good time despite playing with my new GPS and having to turn around to retrieve poly-pocket hair (a kid's toy) which tragically fell into the lake, we lunched at the Sandy Bay campground where the mosquitoes soon found us. After lunch we continued on to the north end of the lake and began the 3.2 km hike into Grey Owl's cabin, tormented the whole way by the swarms of mosquitoes. It's a nice walk if you can enjoy it. Unfortunately, travelling with the 3-year old and the mosquitoes made this trek somewhat less enjoyable than it could have been. In retrospect, I should have portaged a canoe 600m into Ajawaan Lake and paddled to the cabin (less walking for the kids, fewer mosquitoes). As a side note, this cabin was under threat of being lost to fire earlier in the season when forest fires were encroaching. Since then rain has ensued and hardly a fire has burned in the entire province for some weeks now. At the cabin, we signed the guest book and browsed through, finding the names of friends that have been there earlier in the season (including Wildpaddler). The fair weather continued in our favour and we returned under continued calm conditions. The weather was mostly overcast this day and the obscured sun worked to our favour since it meant we were not fried to a crisp. An interesting aspect of paddling on Kingsmere is the remarkably clear water allowing you to watch the lake bottom while suspended twenty feet above. By the end of the day, we had paddled 25 km and hiked 6.5 km, not bad with kids and novice paddlers along. Our next day was another gorgeous one, calm and sunny. It was spent playing on the sandy beach, in the water, or reading while drifting in a canoe (away from horseflies and mosquitoes). On our fourth day we decided to take a tour through the Bagwa Route. Again travelling with only the two canoes, we enjoyed calm weather on Kingsmere Lake. After lunch and an hour or so relaxing and playing on a beach near Pease Point, we round the point to face head winds out of the southwest. Those winds made us work a little harder through the channel and gave us some waves to deal with on Bagwa Lake. We have seen moose before in the weedy channel to Bagwa Lake and our hopes were high for seeing the large mammals but we were not so lucky. We did see pelicans on Lily Lake. The wind blew us down the small lakes of Lily & Claire. The portages between those lakes are very swampy at their ends (as has been the case for many years) and especially the Claire Lake end of the Claire-Kingsmere portage. Portaging with small kids can be no fun, especially when the mosquitoes are horrendous. Once back onto Kingsmere Lake, the wind had diminished again (we were in the lee, but the wind had really dropped away) and our short paddle back to the Southend campsite was very beautiful. All told, it was a 20km day with two portages. Our fifth day was yet another gorgeous weather and the temperature had climbed to the mid-twenties. We packed up and made our way back to the put-in (with the girls fighting over whose turn it was to paddle the kid's kayak). After lunch and ice-cream in Waskesiu and playing at the beach-front playground, we headed out on the highway and made our way home after nearly two weeks away. Prince Albert National Park provides a family-friendly and novice-friendly camping experience. You are never far from help (with the exception of the Bladebone Canoe Route). Wind and waves can be a serious issue that paddlers need to be aware of and prepared for, but there are routes that can minimize this. We were lucky to have the weather we did. Despite that we did not see any large wildlife, the opportunity to see moose and other animals is greater in PANP than most areas I paddle (where moose represent many meals so are hunted by the natives for food). Except for their muddy ends, the portage trails are generally in good shape and well maintained. There is much to see and do, and there are some destinations of historical interest (Grey Owl's Cabin). Although we opted to head to Kingsmere this time out, we have also gone to Crean Kitchen campsite on Crean Lake. The Crean Kitchen campground is smaller than Southend but provides similar amenities including a shelter with wood stove. Crean Lake is larger and more open to wind than Kingsmere so can be a difficult place for open canoes, but the Hanging Heart Lakes should provide no difficulty for most. Sand is even more abundant on Crean than at Kingsmere. Canoes & kayaks can be rented in PANP from the Waskesiu marina or the Hanging Heart Lakes Marina. edited to update & correct the images. Last edited by pawistik on February 10th, 2010, 5:38 pm, edited 1 time in total. Here are some pictures, as promised. My daughter paddled her own kayak. Four hundred metres later we arrive at the roller-ramp which raises the boats enough to allow them to easily slide onto the portage carts. A bridge spans the river here connecting the portage trail with the trail to the parking lot (to the South) and Grey Owl's cabin (to the North). Later that evening we were treated to a very nice sunset at the Southend campsite. During our paddle to Grey Owl's cabin the girls played in the canoe, making use of the centre seat. When unloaded, the kids used that seat as a table more often than as a seat. In this photo you can see the sprinkler and hose atop the cabin which were used (or were ready to be used) in June to prevent the cabin from burning in forest fires which threatened the area. Grey Owl (Archie Belaney) & Annahaero's graves are also here, atop the nearby hill. Did I mentioned we had fair weather? We were very lucky, the wind can come up on short notice and paddlers must be prepared to deal with it. Don't get caught a very long way from shore unawares, especially with kids along. Back at camp, we were joined by some good friends who we had wanted to trip with for a while now. We are not put off by their 2-dimensional personalities. Playing ball is a bit of an unusual activity for us when paddling, but this campsite with a large open area can accommodate it. While the kids played ball, I mixed up some Caesars. edited to correct the image locations which got changed by picasa. Last edited by pawistik on February 10th, 2010, 5:52 pm, edited 1 time in total. Great photos and nice detailed report Bryan. This is one of those areas I've always wanted to check out. Is it true that Grey Owl's favourite canoe paddle is on display at the cabin as well? I was thinking of replicating the design as a future paddle making project. Wow! Cool report Bryan! Another for our "to do" list. Excellent family picture as well! Really enjoyed your report Brian. Excellent pictures. Your new canoe looks good. Great idea with the outriggers for your kayak. Looks like the girls had a blast. Thanks for the kind comments folks. ... Is it true that Grey Owl's favourite canoe paddle is on display at the cabin as well? I was thinking of replicating the design as a future paddle making project. By the way, regarding our new canoe, I was quite disappointed when recently tripping with three other families. Our canoe seemed usually to be the slowest despite that the others were in overloaded aluminum beasts. Then I realised I was towing a kayak with boat bumpers for outriggers dragging in the water! You have a beautiful family, and the thing I noticed most about the pics is all the SMILES. Looks like you had a wonderful time. I've been having troubles with my Picasa web album for the Kingsmere trip pictures. I am not certain why, but my pictures all disappeared from the album. For whatever reason, most of the linked images were still showing up here. Last night I re-uploaded the album. Now, all the pictures that worked are gone. I'll try to figure out what I did or what happened and update the report soon. I gather it has something to do with Picasa, a removable hard drive, and "synced" albums. I finally fixed the photos so after several months, they should now be working again. This will be our first summer with a baby, so it's a big relief to see happy kids out exploring the world in boats! Our kids had a lot of fun this summer playing with friends, messing around in boats. Immediately before the trip in this report, we were about 300 km farther North on the Churchill River with 3 other families for 4 or 5 days. I did a presentation about that trip for the local canoe club and may eventually turn it into a post here too or on my blog. Have a look for Rolf & Debra Kraiker's book on paddling with kids, it's quite good. Also, don't overdo it and don't overestimate your or your partner's skill or comfort levels. On the other hand, the more you get out while they are younger (say a year or three, depending on how well they fit their life jacket and the factors already mentioned), the more comfortable they will get to be in a canoe. Babies are hard because the PFDs are bloody uncomfortable for them. Babies have hardly any neck, yet the life jackets have that huge collar and it was terribly uncomfortable for our kids so 45 minutes or an hour was all we could manage at first. But, with time, that got better and the paddles got longer. They do make some PFDs that look much better and more comfortable now for babies and if we were starting over, I'd likely spend the money and get one of those (like the Salus Baby Bijoux, for instance). Anyway, have fun with it. Nothing better to rock a toddler to sleep than gentle waves while paddling a canoe. Oh, and try not to get too annoyed with the folks who say things like "boy, your life sure has changed now..." or "guess your days of adventure are done." Yes, it's different and adjustments must be made, but that doesn't mean you have to stop (even if you take a brief hiatus). It's all good (even if sometimes it doesn't seem too good) and you will likely find a new type of adventure awaiting you. Last Monday (Aug 22) we took the extended family into Kingsmere. We weren't as ambitious as you and most of our group were inexperienced so we stuck to a day trip. In total , we went in with 23 people, ages 3 to 65 in 6 canoes and a kayak. There were 13 kids under 14. The weather was perfect - 27C with no wind. If you haven't been in there this year, water levels are very high. The river is running over the foot bridge and there is almost no beach along the south end of the lake. A couple of us ran the rapids coming out. It was great but we had to line over a couple river-wide strainers that had created 2' drops. On the way out the kids all floated the lower section of the river between the portage and the landing. I'll post some photos once I figure out how to do it. OK. I think I figured out the photo thing.